W e began the fishing trip by packing our fishing vests. My ten-year-old son, nine-year-old nephew, and girlfriend were going fishing at sun down. You can't be too prepared because unlike a boat, you don't have a tackle box or a tool chest on hand. So we put extra lead headed jigs and the soft baits in their separate plastic containers (old film cylinders work well for this). I slipped the stainless pliers into the vest holder and the camera into another pocket. I outfitted everyone with a medium tackle pole using 12lb test and a jig and soft rubber fish. We then put the top down on the convertible, loaded our fishing poles, vests and cooler into the car and drove off to the north tip of Bokeelia. We parked the car and the four of us walked out in the water. It was just at sundown. The Pelicans, Ibis and other day birds were flying overhead on the way to their evening roosts. The Night Herons took their place. At the beginning we all stayed pretty close together but after the others felt a little more secure they began spreading out to see if they could find fish. It was now quite dark and the thoughts of a feeding Shark or a rare but possible alligator began to enter my mind. We all decided it was time to go. As we walked towards the shore I continued to cast towards the shore in front of me. On what would have been the last cast something picked up the jig. I set the hook and the fish raced past me towards open water. I picked up the slack and began the fight. Almost immediately the fish started making a beeline for a fishing pier that was off to my right. With 12lb test and the drag set as tight as I could justify there was still no hope of stopping the fish. I felt by now it was probably a Snook as they clearly have the smarts to head for structure to break of the line whenever they're hooked and there's structure nearby. In a strange twist of good fortune (for me), the fish stopped short of the pier by about twenty feet. The fish thought his tactic was not working and changed tactics. Now the fish was making a beeline for me. I was picking up the slack as fast as I could but the fish was coming towards me faster than I could retrieve the loose line. I announced to the family that the fish was coming straight at us. They all huddled behind me. Evidently at some point in the fight I threw out the possibility that I hooked a Shark and though I'd since dispelled that notion, they hadn't forgotten. We moved down the coast shuffling our feet as we went to avoid coming down on any surprised StingRays. Rays are very common around here, as are a large variety of crabs and shells. The best way to avoid getting punctured is to shuffle your feet as you walk. Unless you have thick leather shoes on like I do. I've had a pair of Rockport walking shoes that I've been wearing in the salt water off and on for over eight years now. They allow me a lot more freedom and confidence than a pair of sandals or bare feet. A few seconds later I'd picked up the slack in my line feeling lucky to still have the fish on. Soon the fish tired and I reeled in a beautiful Snook of about ten pounds. 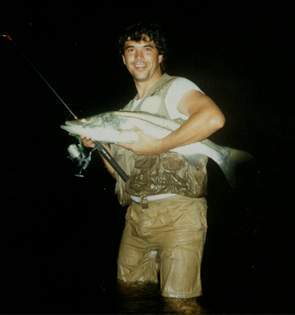 It was the first Snook I'd caught since living in Ft. Myers over 20 years ago. I was very happy. Very, very happy. I then pulled the landing net out from where I'd tucked it in the back of my shorts and scooped up my prize. I handed the camera off to Michelle and she took this picture. The fortunate Snook was then released as it was still August and the Snook season doesn't start till September. Oh well. Since that day I've caught many more Snook during season so have not been deprived of the incredibly great meal they make. The fishing was good. We had caught numerous Trout and most importantly, I wasn't the only one catching fish. Everyone had caught a few. Welcome to Pine Island Snook Fishing.